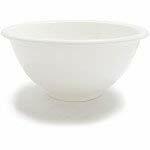 Sur La Table Italian Whiteware Deep Serving Bowl 30105003800 , Large, 14¼" x 7"
Product prices and availability are accurate as of 2019-04-20 14:49:03 EDT and are subject to change. Any price and availability information displayed on http://www.amazon.com/ at the time of purchase will apply to the purchase of this product. From casual to formal, our versatile white Italian ceramics set a beautiful table for any occasion. Each piece showcases the character and attention to detail developed over years of painstaking craftsmanship. The perfect serving dish and handy for prep work, these deep bowls with their clean, classic shape also makes a great place to present fresh fruit or flowers. Safe for dishwasher. Not for oven or microwave use. Made in Italy.